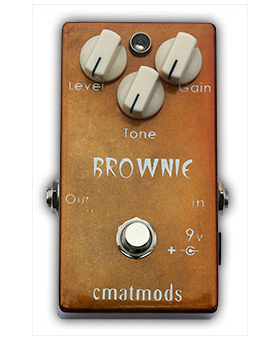 The Brownie has controls for Gain, Level and Tone. This pedal uses the BSIAB circuit (Officially Licensed). Footprint of a Boss or Ibanez and has a bright blue LED and True Bypass. This distortion pedal sounds like a Marshall on 11. It has great bass and attack response. The Brownie has MILES of sustain and a TON of gain. Pedal is dead quiet with hardly any noise. Many thanks to Ed Guidry for this one!